Ranakpur is named after Rana Kumbha whom Dharna Sah, a Jain entrepreneur, approached when he had an apparition of his great temple to ask for the land for its construction. Renowned for some marvelously carved Jain temples in amber stone, Ranakpur is amongst the five holiest places of the Jain community and exceptional in beauty. These temples were constructed in the AD 1439. The temple is located in the gorgeous Aravali ranges. It is one of the most important pilgrims among the five pilgrims of the Jainism. 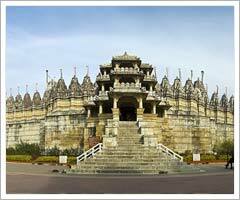 It is perhaps the most Byzantine and colossal of Jain temples in India, the area of the temple is about 40,000 square feet. There are four subsidiary shrines, twenty four pillared halls and eligibly domes supported by over four hundred columns. The total number of columns is 1,444 all of which are intricately carved no two being alike. The artistically carved nymphs playing the flute in various dance postures at a height of 45 feet are an enthralling sight. In the assembly hall, there are two big bells weighing 108 kgs whose sound echoes in the entire complex. The main 'Chanukah' temple is dedicated to the trithankara Rishabdeoji and a four-faced image is enshrined in the inner sanctum, open on all four sides. An enormous basement covers 48,000 sq. feet. There are images of Adinath in the North West, Parshvanath in the north east, Ajitnath in the south-east and Lord Mahavir Swami in the south west. The artistically carved nymphs playing the flute in various dance postures at a height of 45 feet are an engrossing sight. In the assembly hall, there are two big bells weighing 108 kgs whose sound echoes in the entire complex.